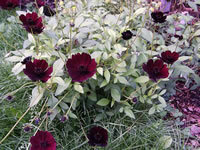 Chocolate Cosmos can also be grown in containers provided that a high quality planting mix is used. The Chocolate Cosmos plant is a tuberous perennial that is hardy in USDA zones 7-10, but with excellent drainage and heavy winter mulching it will often survive the winters in zone 6. 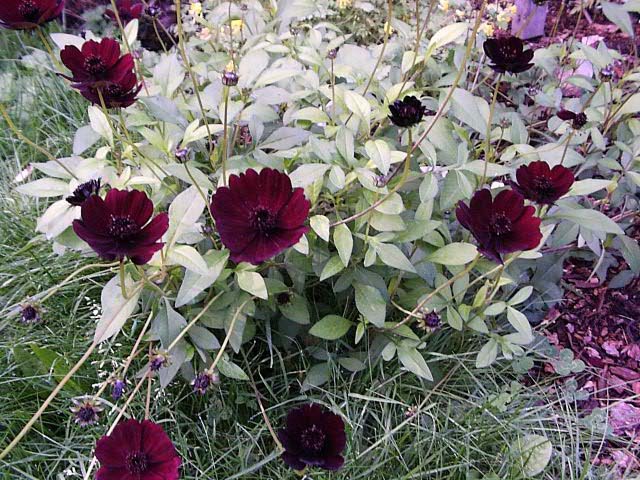 Chocolate Cosmos should be planted in full sun, in rich well draining soil. Apply a good all-purpose fertilizer when new growth appears and again at mid-season. Always remove the spent flowers promptly for continued blooms. you can dig the tuber just as you would with Dahlias. of the tubers, and store them in slightly moist peat moss in a frost free place. 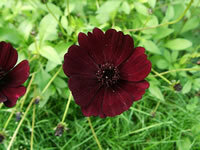 Chocolate Cosmos can be propagated by division of the tubers. To produce a new plant, each tuber must have an eye (the new growth bud) which appears at the point where the tuber connects to the main stalk. Using a sharp clean knife carefully separate tubers. Discard any damaged tubers and any that don't contain an eye. Place the tubers in a bed of sawdust or vermiculite, inside a cardboard or wooden box. Store them in a dry area where the temperature will remain at about 40 degrees F.
or for mildew treat with a dry fungicide such as captan.